Council and counsel sound a little alike, but their meanings seem similar but they are different. Council is a noun meaning a group of people that make decisions. Counsel is used as a noun and a verb. As a noun it means advice or a lawyer. As a verb, it means to give advice or an opinion. 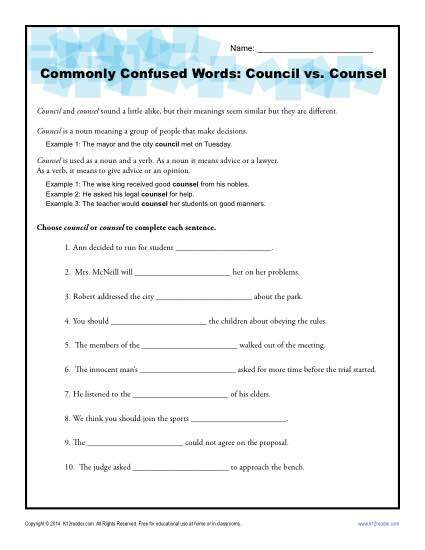 Print this worksheet out and have your students choose council or counsel to complete each sentence. You may find it helpful for Common Core Standards for Language for 4th grade, although it may also be useful for other students.